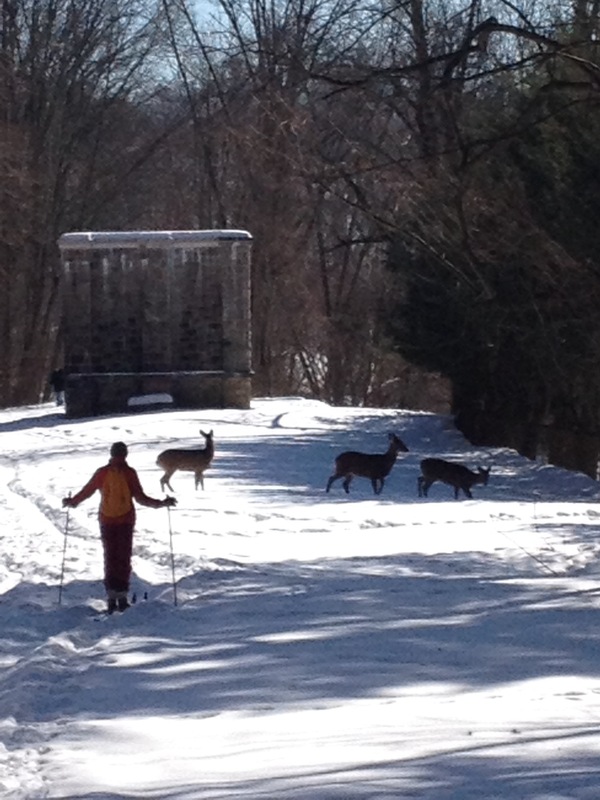 Cross-country skiing and snow shoeing are suddenly popular. A few years ago, walkers who saw me on my skis used to ask “ Where do you get skis like that?” Now the tracks on the trail are already formed when I get out on an afternoon. Snow-shoe tracks are even more prevalent sometimes breaking up the smoother ski tracks. Some sections of the trail are better than others. My recommendations are: Park your car at Gorey Brook road in Sleepy Hollow. Here there’s an easy entrance to the trail where it runs parallel to the Rockefeller Preserve. Skiers who don’t like hills should stay on the Aqueduct for a smooth tranquil run past the Sleepy Hollow Weir Chamber and north to the bridge over the highway. Those who like hills should enter the Rockefeller Preserve just north of the Weir chamber and follow Peggy’s Way south for some gentle hills before returning to the Aqueduct. Another beautiful section is in Hastings, starting at Washington Avenue and accessing the trail just south of Aqueduct Lane. This section, down to Untermyer park has good views of the river and the Palisades and relatively few streets to cross. Some skiers remove their skis at street crossings but one can clump slowly across the pavement without a problem. Give it a try before the snow disappears! Questions? Call Mavis 914 693 0529.